Distance education and eLearning tutors of the Poly’s Centre for Open and Lifelong Learning (COLL) will soon enter a new technological dimension in teaching when they will start to conduct live tutorial sessions with students across Namibia via teleteaching, also known as web conferencing. This new technological concept to teaching in Namibia was introduced to the Poly by Professor Gerhard Partsch of the Deggendorf University of Applied Sciences in Germany. The visit by Partsch was initiated and facilitated by the Department of Planning and International Relations. The use of web conferencing allows participants to connect to and chat with people all over the world in real time. Participants may conduct meet-ings, lectures or hold tutorial sessions from the comfort of their offices, while students can participate in classes from wherever they are. All that are needed are a reliable Internet connection and a headset consisting of headphones and a microphone. Dr Delvaline Möwes, Head of COLL, said there are various software programmes available that facilitate online teaching. “These programmes can enhance teaching and learning by allowing one to lecture, conduct training and meetings, edit documents jointly and share applications without the constraints of having all participants present in one location. Lecturers and students can have an interactive tutorial session while experts will be able to present guest lectures to the class from wherever they are in the world. The software also allows for the recording of live sessions, which means that students who missed the session, or simply want to watch it again, can do so offline,” Möwes explained. 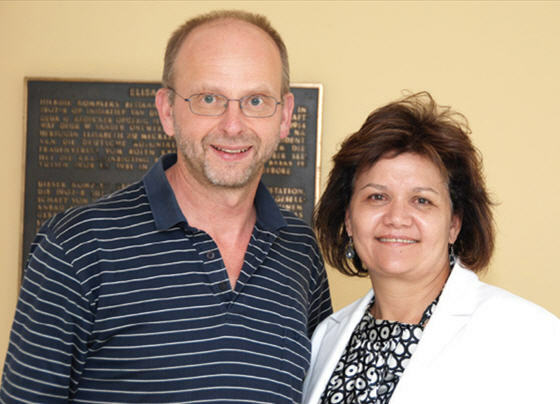 The teleteaching course for training distance education and eLearning was developed by COLL’s Coordinator for Educational Technology, Leena Kloppers, and Ernst Elsener, an expert from Switzerland.